For each pattern row cut and remove 2 Fabric Threads(FT), leaving 2 FT. Bundle groups of 4 FT, i.e. one stitch is worked over 4 x 4 FT. You can also remove 3 FT and leave 2 FT, bundling 3 FT together, achieving a ratio of 5:3. These are just two possible variations. that you first work the narrow border in the basic instructions on a separate piece of fabric, just to get a feeling for it. Book 126 Myreschka Needlework Ideas includes detailed, step-by-step instructions. Once you've completed this small piece, you can work all larger projects without any problem. All smooth, even-weave needlework fabrics are suitable. Choose cotton, linen or a blend, according to taste. Make sure that the warp and weft thread count is the same so that lengthwise and crosswise borders are identical. 3256 BELLANA is very suitable for your first Myreschka project. With a thread count of 20 Threads/inch and smooth threads, it is particularly easy to count. 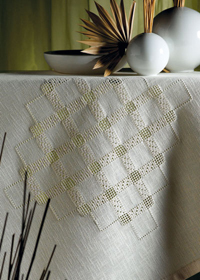 3835 LUGANA is, like BELLANA, a cotton/viscose rayon blend but has a higher thread count (25 Threads/inch). Thus the borders turn out more filigree. 3711 ARIOSA is a special effect fabric made from flamm? yarns. The special texture harmonizes well with the clear structure of Myreschka patterns. ARIOSA has a thread count of 7.5 per cm or 18 per inch and is thus well-suited for your first Myreschka project. Similar textured weaves of interest are 3972 MERAN with 11 threads/cm or 27.5 count/inch. Myreschka borders look posh and elegant when worked on linen. 3604 DUBLIN has an open weave and is fairly sheer, making for particularly delicate embroidery. However, with a thread count of 10 per cm or 25 per inch, this fabric is more for advanced embroiderers than for beginners. Myreschka is usually worked with pearl cotton. Its fine sheen lends the rigidly structured borders particular charm. Required thread size depends upon the fineness of the weave. The rule of thumb is: pearl cotton #5 for 7 to 8 threads per cm or 18 to 20 count per inch, #8 for 9 to 11 threads per cm or 23 to 27 count per inch. If working with pearl cotton #8 on a coarser fabric, you'll have to add a row of filler stitches. This will also be necessary if you remove 3 threads instead of just two per pattern row. In other words, the embroidery thread must completely fill the row.